Keel: Flat bottomed welded and riveted metal. 24m Dutch metal barge,1904. 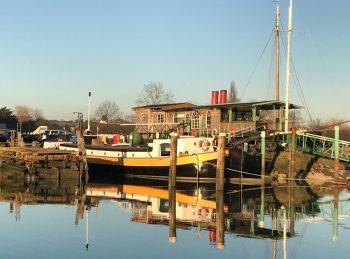 a Hasselter Aak fully converted to a live aboard property. 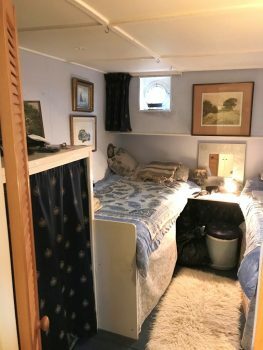 She has many original features and is found to be a very comfortable spacious mobile home. has been added to her underwater surface. The anodes replaced and a new outlet valve for the sanitation services. The decks and accommodation are painted over the steel. 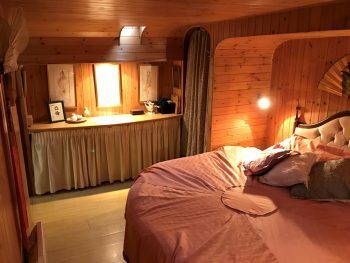 Inside the accommodation, there are three cabins 1 x double 1 x twin and 1 x single. 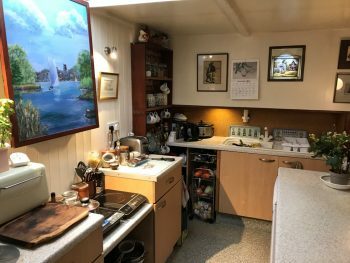 The old day cabin has been opened up now integral with the saloon and open-plan galley. There is extensive space throughout the accommodation for both living and working. 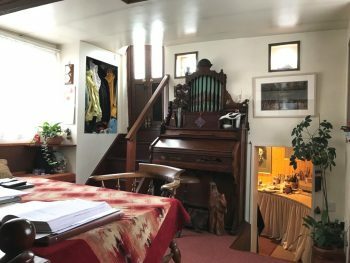 The Aft cabin is presently used as an artist’s studio/ workshop. 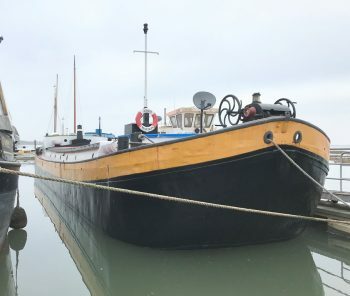 The present owners completely refitted the barge, installing innovative energy efficient systems and environmentally friendly solutions to her domestic services ( The hull is foam insulated throughout, secondary glazing at the portlights and there is a Microphor marine sanitation plant. 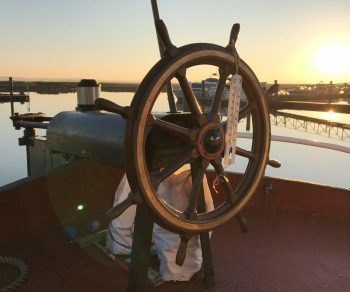 The barge has no engine, she is mobile, having been towed around to different berths in different marinas over the past 20 years. Essex, Suffolk And Norfolk. She offers a unique floating home with the ability to relocate whenever required. Viewing Highly recommended. 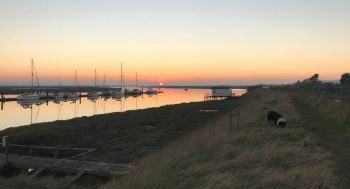 Recently moved onto a Residential Mooring, at Bridgemarsh Marina, 0.3kms from the nearest rail station to London via Wickford. 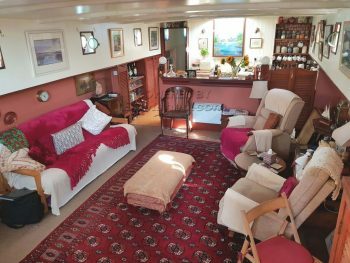 Berths: 4 Twin and a double cabin. Large saloon and day cabin. 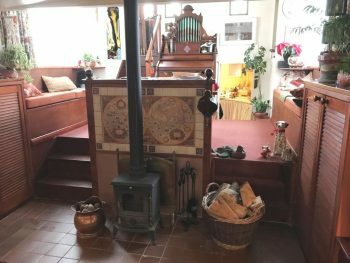 Solid fuel stove centrally sited. integral galley , full width of the barge. access fire door through to forward cabins. Galley has induction hobs, a combination microwave oven. Small dishwasher double sink and drainer with pressurised Hot and cold water. free flowing pump out. 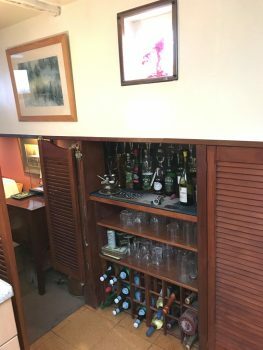 Guest cabin has 2 x large hanging wardrobes and twin single berths. 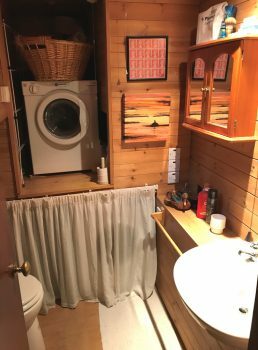 Family Bathroom with a Full standing shower in the bath, an electric toilet and wash basin. Electric heated towel rail. Master cabin has a large double bed walk around vanity units/ dressers on both sides of the bed . Access steps out through a deck hatch. 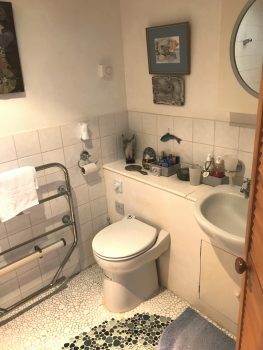 Ensuite which offers an electric toilet, washbasin. Clothes airer, washing machine and drier. The vessel is in good decorative order. All services are functional and well maintained. 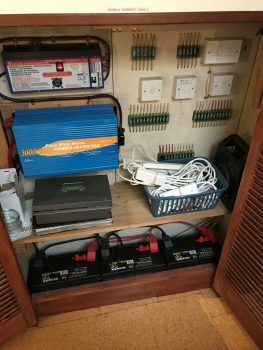 240v mains circuit throughout. The forepeak is separated by a watertight bulkhead. in here there is the sanitation system and bosuns locker. Engine Description: There is no engine. Welded and riveted iron and steel construction. hard chined flat bottomed. Twin bladed rudder, wheel steering from aft deck. Welded and rivetted iron and steel construction. Iron hull, decks and superstructure is steel plate. Twin bladed rudder, wheel steering from aft deck. communication mast. New over plating added to her underwater hull September 2018. Vessel re surveyed and metal thickness tested, reports available. All sound. She also qualifies as a VAT exempt vessel. Decks and coachroof and hatches are all of steel and painted. Companionway entrance steps accessed via the aft deck. Good standing headroom 6ft 6ins plus throughout apart from the aft cabin reduces to approx 5ft 7ins.